These are my maternal great aunts and uncles and my grandmother, the sons and daughters of John Taylor Roberts and Catherine Margaret Young. This photograph was taken in 1947 at the J.T. Roberts house (what we call "the Big House") on Wells Street in Valdosta, Georgia. Seated in foreground is Dinah (Mary Remer) Roberts Parramore. Seated behind her is Edwina (Midge) Roberts. 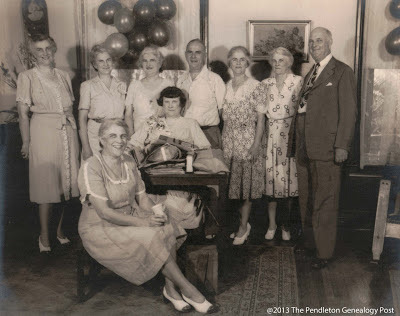 Standing, left to right: Martha Leona Roberts Redles (my maternal grandmother), Margaret Roberts Graham, Stella Roberts Pendleton, John Young Roberts, Maie Dell Roberts Covington, Kathleen Roberts Winn, and William Leland Roberts. What a great photo! So nice to have one of them all together.